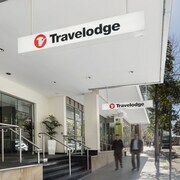 Situated in the historical district, this hotel is within a 15-minute walk of Kirribilli House and Luna Park. Circular Quay and Overseas Passenger Terminal are also within 2 mi (3 km). Sydney Milsons Point Station is 13 minutes by foot and Sydney Circular Quay Station is 21 minutes. 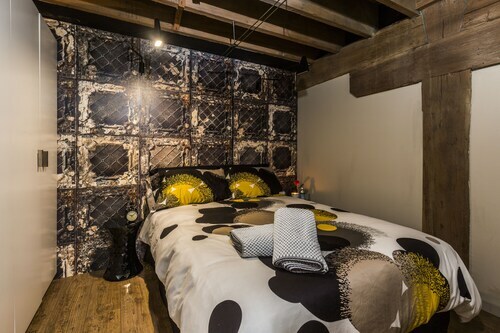 In Sydney's Potts Point district, this contemporary hotel is a 5-minute walk from Kings Cross dining, shopping, and nightlife. Darling Harbour and the Sydney Opera House are 2 km (1.2 mi) away. The Langham Sydney is situated near the central business district and within walking distance of the Sydney Opera House, the Sydney Harbour, and the Sydney Bridge. 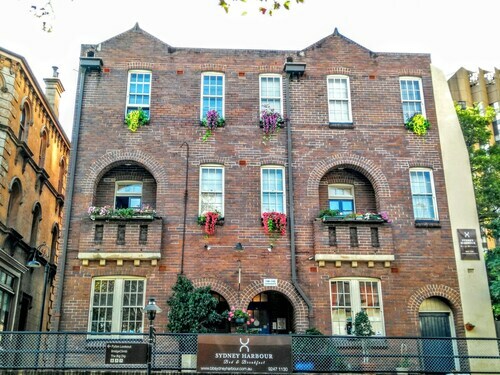 Situated in the suburbs, this hotel is within 2 mi (3 km) of Enmore Theatre, University of Sydney, and Royal Prince Alfred Hospital. Capitol Theatre and International Convention Centre Sydney are also within 3 mi (5 km). Sydney St Peters Station is only a 3-minute walk and Sydney Erskineville Station is 11 minutes. Situated in Burwood, this lodge is 3 mi (4.9 km) from DFO Homebush and within 6 mi (10 km) of Qudos Bank Arena and University of Sydney. White Bay Cruise Terminal and Birkenhead Point Outlet Centre are also within 6 mi (10 km). Sydney Burwood Station is 8 minutes by foot and Sydney Croydon Station is 14 minutes. 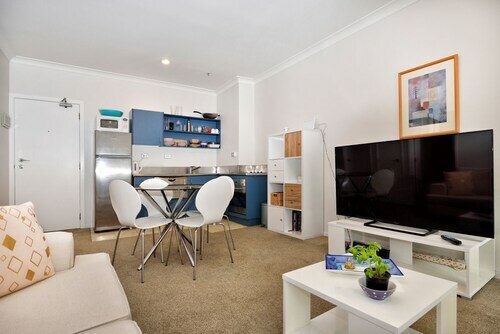 This family-friendly Marsfield apartment building is located in the business district, 0.9 mi (1.4 km) from Macquarie University, and within 9 mi (15 km) of Lane Cove National Park and DFO Homebush. Sydney Olympic Park Athletic Centre and ANZ Stadium are also within 9 mi (15 km). Macquarie University Station is 22 minutes by foot. 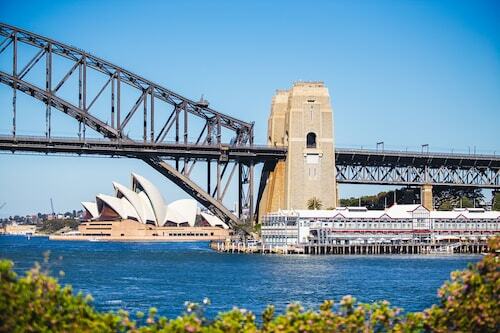 Situated on the waterfront, this luxury hotel is within a 10-minute walk of Sydney Harbour Bridge, Overseas Passenger Terminal, and The Rocks Markets. Circular Quay and Sydney Opera House are also within 1 mi (2 km). Wynyard Station is 20 minutes by foot and Sydney Circular Quay Station is 16 minutes. Located in Sydney Eastern Suburbs, this vacation home is within a 15-minute walk of Bondi Icebergs, Bondi Beach, and Tamarama Beach. 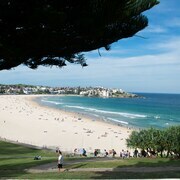 Coogee Beach and Bronte Beach are also within 3 mi (5 km). Bondi Junction Station is 26 minutes by foot. 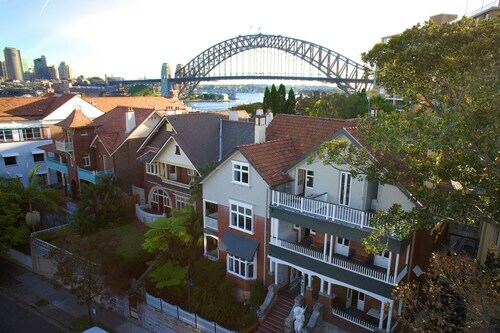 Located in the heart of The Rocks, this historic bed & breakfast is within a 15-minute walk of Circular Quay and Sydney Harbour Bridge. Sydney Opera House is 0.8 mi (1.2 km) away. Wynyard Station is 9 minutes by foot and Sydney Circular Quay Station is 9 minutes. 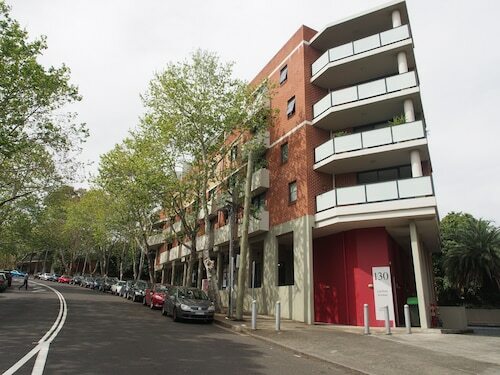 Situated in Chippendale, this apartment building is within 1 mi (2 km) of University of Technology Sydney, University of Sydney, and Capitol Theatre. 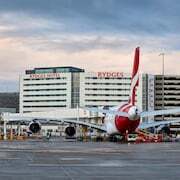 International Convention Centre Sydney and Powerhouse Museum are also within 1 mi (2 km). Redfern Station is 12 minutes by foot and Sydney Redfern Station is 11 minutes. 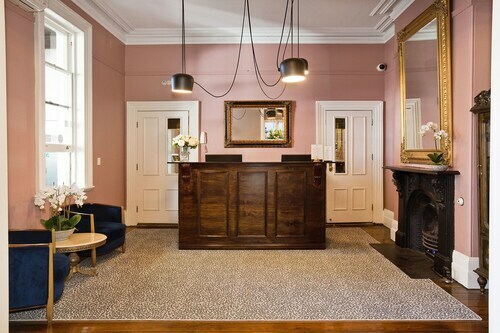 What are the top amenities at pet-friendly Sydney hotels? 5-star luxury: Even on holiday with your furry family members, you can still live in the lap of luxury. Soaking tubs and rainfall showerheads, premium bath products, espresso makers, and more are all on offer. You will have to leave your pet with a dog-sitter to check out your hotel’s day spa, though—they don’t do doggie massages. Room service: After a day of exploring, you may not want to think about finding a dog-friendly spot for dinner. We get it. Room service is the easiest way to dine with your pet, and you’ll find it at many dog-friendly hotels in Sydney (some even have 24-hour service for those late-night cravings). Amazing hotel deals: You might think these amenities come at a price, but when you book with Wotif, you always get the best deals around. What are the most dog-friendly neighbourhoods in Sydney? The Rocks: This is one of the most central areas where you’ll find pet-friendly hotels, and plenty of things to do, too. Throw the ball in off-leash Observatory Hill Park, then head to Circular Quay to watch the ferries come and go. 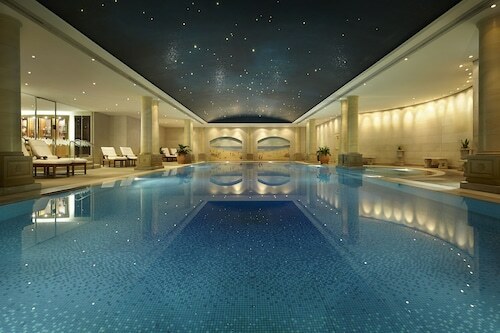 The Langham Sydney is the perfect place to retire after a long day of fun. Paddington: The Paddington Markets are a popular pet-friendly activity in Sydney, and the neighbourhood is full of cafes and pubs where you can grab a drink with Fido. The Hughenden Boutique Hotel is walking distance from the market and the famous Allianz Stadium, and right across from the Centennial Parklands—a great place for a stroll with your pooch. Potts Point: This coastal suburb is home to an off-leash dog park, Embarkation Park, and is known for its scenic strolls. 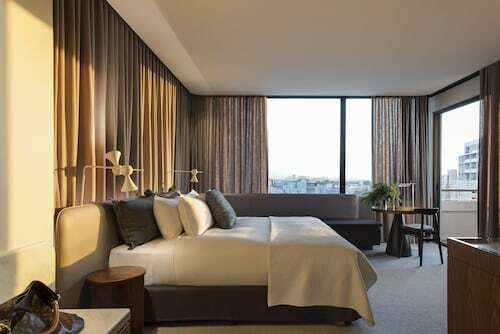 The Larmont Sydney by Lancemore is in the southern part of Potts Point, near Kings Cross, which is known for its bustling nightlife. Find a restaurant with a dog-friendly patio and watch the world go by with your best friend. 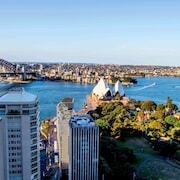 North Sydney: Hop across the channel and you’ll find loads of strolls for you and your pup (try the Kirribilli to Lavender Bay Walk for sweet views). Plus, nearby Mosman is home to several dog-friendly beaches. 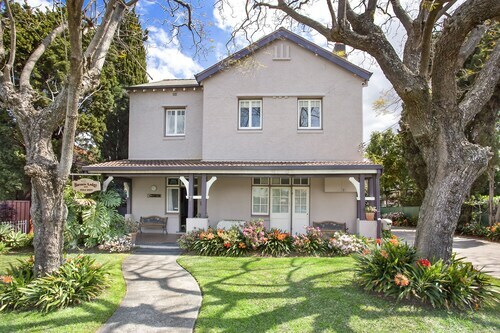 Glenferrie Lodge, in the neighbourhood of Kirribilli, offers pet-friendly accommodation on a budget, so you can spend your dough at the local cafes instead. Bondi Beach: Fido just wants to while away the day watching surfers and soaking up the sun—or maybe that’s you. Either way, we won’t judge. Your private terrace at All The Views Bondi Beach is just the place to do it.